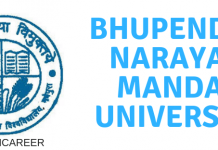 Shaheed Rajguru College of Applied Sciences for Women Cut Off 2019 – Shaheed Rajguru College of Applied Sciences For Women is a constituent college of the University of Delhi fully funded by Govt. of NCT of Delhi. It was established in 1989. This college offers a degree in professional courses like Electronics, Food Technology, Instrumentation, Computer Science, Biomedical Science, Mathematics, Physics and Chemistry. These courses provide a platform where the students are equipped with essential theoretical and practical knowledge to face the challenging positions worldwide. The college at present has more than 700 students hailing from various parts of the country. Every year, this college release multiple cut-off lists for admission to various undergraduate courses on the basis of class 12 board marks. 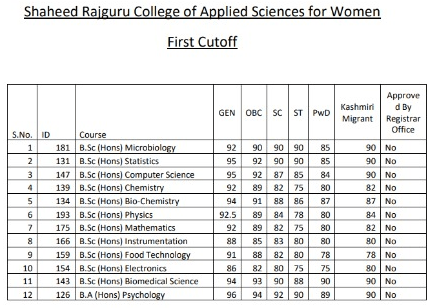 The candidates who meet the Shaheed Rajguru College of Applied Sciences for Women Cut Off 2019 are granted admission to this college. 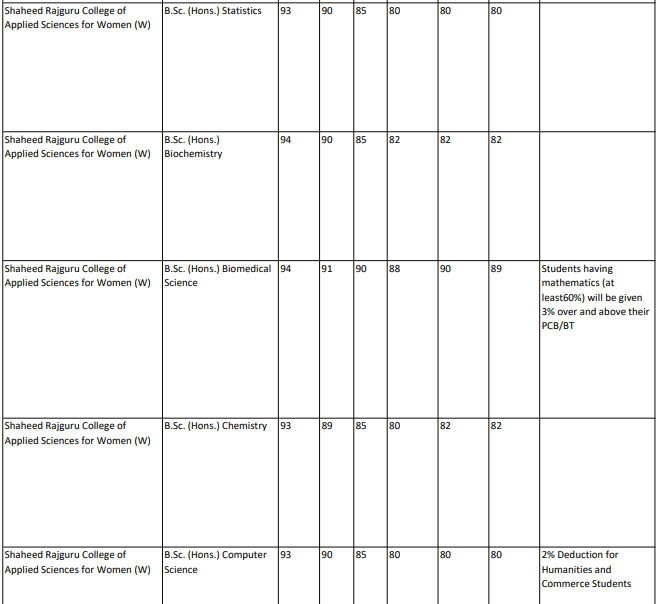 To know about the Shaheed Rajguru College of Applied Sciences for Women Cut Off 2019 for admission to the academic session 2019, read below. 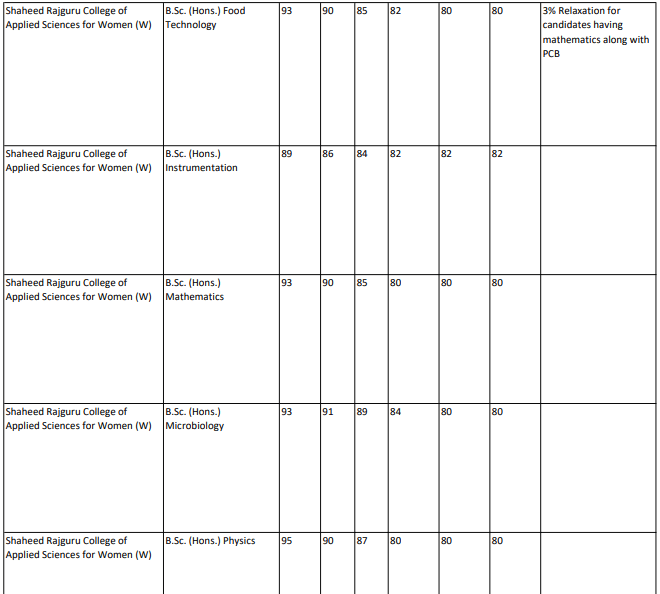 The candidates applying for the admission to Shaheed Rajguru College of Applied Sciences for women must keep visiting the website on a regular basis for the latest updates regarding the cut off list. It is important that the candidate must be aware of the latest released notifications of the cut off list. The officially released schedule will provide the important dates of the admission procedure which will be important for the candidate applying for the admission. Once the official schedule is available, the applicant must save and download it so as not to miss any of the important dates and events. 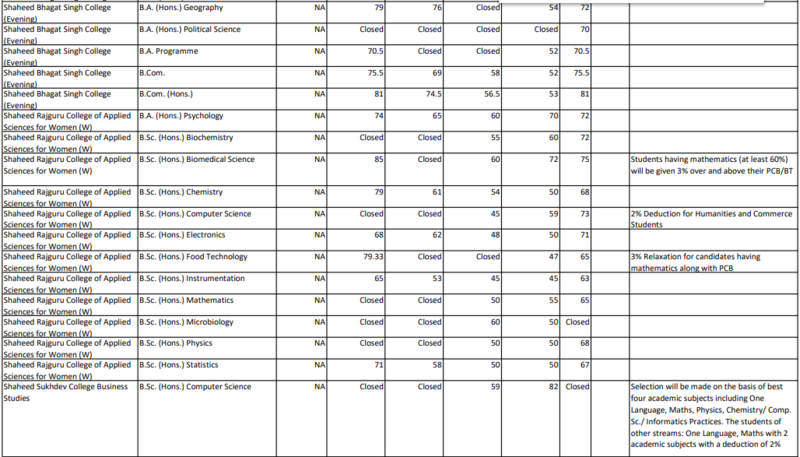 Go through the tentative schedule of the cut off list from the tabular format below. The officially released dates will be available once it is announced by the University. The cut off of Shaheed Rajguru College of Applied Sciences for women will be released in an online mode on the official website of the University. Candidates who have successfully filled up the Application Form will be able to go through the cut off list. The availability of the cut off list will be as per on the date as mentioned in the officially released schedule. The cut off list will provide the minimum of the marks to be secured by the candidate in their qualifying examination. The cut off marks will vary as per the course and the stream for which the candidate will be applying for. Once the list is available in a PDF format, the applicant must save and download it for future references. It is important for the candidate that they must fill up the form and submit it before the due date. The details provided in the form has to be valid and correct. Any form of misleading detail will prohibit the applicant from proceeding with the admission procedure further. The details will be cross-checked at the time of the final admission by the college authorities. The Applicants can go through the procedure of checking the cut off list of Shaheed Rajguru College of Applied Sciences for women. It is important that the candidate must avoid any form of error while checking the cut off list which will be available in an online mode. Next articleHPBOSE SOS Admit Card 2019 Released! !